I don’t know exactly what’s going on here, but I want in. 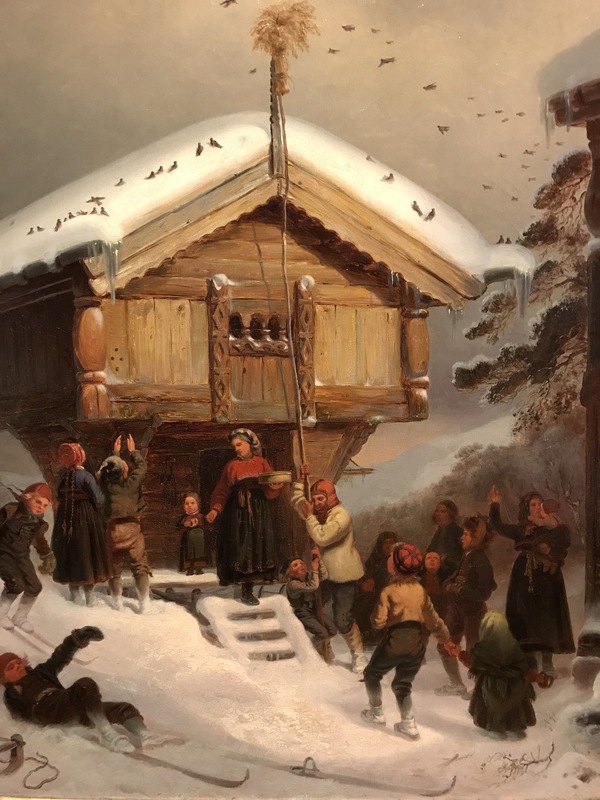 The painting, from Norway’s National Gallery in Oslo, is “Traditions of Christmas” by Adolphe Tideman, 1846. It looks like a sheaf of wheat is being hoisted up on the rooftop for hungry birds. And there are skis, and puffy snow to tumble into. Works for me! Viggo Johansen painted his family celebrating in “Silent Night,” 1891, now in the Hirschsprung Gallery, Copenhagen. He painted his wife, his children, and a servant around their tree with lighted candles. The artist most likely only painted himself as an arm reaching for his son’s arm behind the tree. The museum commentary explains that Christmas was the best day for quite awhile in the Johansen household. Within a day or so, all the kids were down with measles. The artist left the tree up for four months so he could finish the painting while also tending a houseful of sick children. In Copenhagen right now, street markets are bright with berries, and the grand assembly room at the Workers’ Museum is set up for a party. Children are cozy in their insulated onesies. Every time I see one, I want one for myself. I’m not sure the sun is shining today in Copenhagen, but it was a sunny day a couple of weeks ago at City Hall. Back in my hometown of Minneapolis, where many Scandinavian people ended up as immigrants, the Swedish Institute has decked the halls. The lakes are frozen, there’s just enough snow to call it a White Christmas, and it’s COLD. And at Christmas dinner today, I have not only grandchildren but a new granddog: a sheepadoodle. Merry Christmas to all! This entry was posted in Uncategorized on December 25, 2017 by Claudia Suzan Carley.